Looking for How to Substitute Honey For Sugar in Home Canning and Cooking in 2019? Scroll down this page and follow the links. And if you bring home some fruit or vegetables and want to can, freeze, make jam, salsa or pickles, see this page for simple, reliable, illustrated canning, freezing or preserving directions. There are plenty of other related resources, click on the resources dropdown above. If you are diabetic, keep in mind that honey does not reduce the calorie or carbohydrate content of the sugar syrup, and thus is not acceptable sugar replacements for people on diabetic diets. You may also be interested in our page about substituting Agave nectar for sugar. Honey adds moisture that table sugar does not have. And honey can cause baked foods to brown more quickly. 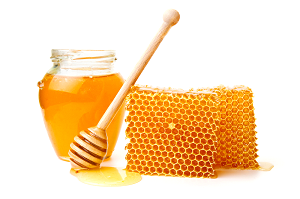 Moisture: If you just swap honey for sugar the finished product would likely be rather soggy and sticky. But, if we examine the rest of the ingredients in a recipe, we can determine which items will absorb some of the water in the honey and increase those to compensate. Or we can take the opposite approach and reduce some liquid from the recipe. Density: A cup of granulated sugar weighs 8 ounces (1/2 lb or 1/4 kg; 250 grams). A cup of honey weighs 12 ounces (3/4 lb or 340 grams). So if you were to substitute honey in a recipe that calls for brown sugar, you'd be adding twice the amount of food. A cup of brown sugar weighs only 6. But a cup of maple syrup weighs 11 ounces and it slightly less sweet than honey; so you should use about 10% less honey than maple syrup. Flavor: Honey has its own unique flavor. General it is a light and pleasing flavor, but if it conflicts with the desired taste of your recipe, there's not much you can do about it. However, most people seem to like the flavor that honey adds! Acidity: Since honey adds acid to a recipe, if the recipe is sensitive to that you would have to neutralize with the addition of a pinch of baking soda. Adding 1/8 teaspoon of baking soda per cup of honey is advised in baking, but since most canning recipes prefer acidity, no action is needed if you are using honey in place of sugar in canning. These are general recommendations and since the type, quality and properties of the other ingredients affects how the sweetener acts, you may have to do some trial and error to get the exact substitution for the results you want. But these rations should work and be tasty! To use honey in place of sugar, use 7/8 cup for every cup of sugar, and don't change the other liquids. According to food labs, honey may be substituted effectively for up to half the sugar called for in a canning syrup recipe. Molasses: To substitute honey for molasses, use exactly the same amount. The resulting flavor and color will be a but lighter and less heavy. The reverse is true if you swap molasses for honey. Corn Syrup: To substitute honey for corn syrup, use exactly the same amount, but reduce any other sweet ingredients, since honey has more sweetening power than corn syrup. Brown Sugar (Demerara sugar or dark brown sugar): Follow the equation for plain table sugar under General Recommendations, but also substitute molasses for a portion of the honey to retain the expected flavor - (brown sugar is just white sugar where the molasses have not been completely removed by refining). Brown sugar, on the other hand, attracts moisture, so it will keep baked goods from drying out so quickly. Also, brown sugar has some molasses in it, which adds moisture, and certainly changes the taste. Raw Sugar (Soft Brown Sugar): Basically, raw sugar is similar to dark brown sugar, but has much smaller crystals and a higher portion of retained molasses, so follow the guidelines for substituing honey for sugar above. If substituting raw sugar for regular cane sugar or brown sugar, use about 20% more raw sugar. Treacle is the British generic name for molasses or any syrup made during the refining of sugar cane. Common names used are Treacle, Black Treacle, Molasses, Golden Syrup and Blackstrap. "Lyle's Golden Syrup" is the most commonly used brand in cooking. Follow the same guidelines for molasses, above. Substituting plain water for the sugar syrup reduces the calorie content of canned fruit by approximately 205, 280 or 375 calories per pint, assuming 2/3 cup of thin, medium or thick syrup, respectively, is replaced with water. In many cases you can use water instead of sugar or other sweetener, because sugar rarely is used for preservative proprieties... BUT, the products may taste awful with no sweetness! I'll point out (in the recipes on other pages) when it can be done and how much it appears to affect taste. This is the same type of standard canner that my grandmother used to make everything from peaches to jams and jellies to tomato and spaghetti sauce. This complete kit includes everything you need: the canner, jar rack, jar grabber tongs, lid lifting wand, a plastic funnel, labels, bubble freer, and the bible of canning, the Ball Blue Book. You'll never need anything else except more jars and lids!